Many of these orphans die - stress, insufficient warmth and incorrect diet being the main causes of death. Kangaroo and wallaby joeys are particularly sensitive to stress, but wombats are tougher, and a surprising number survive the shock and distress of being suddenly and often violently dislodged from the dark, warm closeness of the pouch and exposed to the bright, noisy strangeness of a human's world. Barking dogs, children's inquisitive fingers, looming faces - it does not take much imagination to appreciate the terror a newly orphaned animal must experience, but a young wombat will usually adapt to them all with remarkable rapidity. It will, of course, have a much better chance of survival if at least some of the details of its normal development and way of life are known. It is adapted to an environment that is completely temperature controlled, with food available on demand, so it must be provided with a warmed substitute pouch and frequent meals of a low-lactose milk if it is to thrive. 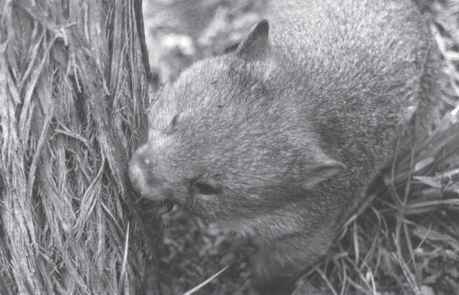 A young wombat is a delightful creature - intelligent, playful and affectionate. It loves, or rather demands, human company, preferably for 24 hours a day. Most road victim orphans are between four and eight months old; any younger, they are extremely difficult to rear, and most do not survive (Figure 8.1). Older ones are out of the pouch and usually flee into the bush when the mother is killed - only a few of these would survive.